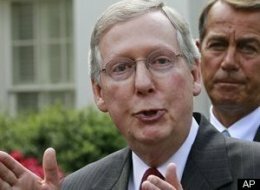 McConnell (R-Ky) managed to get 41 GOP senators to vote against even DEBATING the financial reform bill. This, after his private meeting with Sen. Cornyn and a group of 25 Wall Street executives, most of them hedge fund managers, a week earlier. As a financial reform bill starts to take shape in Washington, two key lawmakers came to New York City last week to explain what it means for Wall Street, and how financial executives might help prevent some of its least market-friendly aspects from becoming law by electing more Republicans, FOX Business Network has learned. About 25 Wall Street executives, many of them hedge fund managers, sat down for a private meeting Thursday afternoon with two of the most powerful Republican lawmakers in Congress: Senate minority leader Mitch McConnell of Kentucky, and John Cornyn, the senior senator from Texas who runs the National Republican Senatorial Committee, one of the primary fundraising arms of the Republican Party. It was revealed earlier in the week that McConnell's talking points came directly from a memo created by GOP pollster, Frank Luntz, and are nearly all completely false. McConnell's hometown paper published a scathing editorial titled "McConnell to big banks' rescue". The Lexington Herald-Leader accuses McConnell of pandering to Wall Street executives ,as well as his repetition of the false talking points created by Luntz. In his weekly remarks, President Obama accused Mitch McConnell of lying. You GO, Mr. President! Now, unsurprisingly, these reforms have not exactly been welcomed by the people who profit from the status quo – as well their allies in Washington. This is probably why the special interests have spent a lot of time and money lobbying to kill or weaken the bill. Just the other day, in fact, the Leader of the Senate Republicans and the Chair of the Republican Senate campaign committee met with two dozen top Wall Street executives to talk about how to block progress on this issue. Lo and behold, when he returned to Washington, the Senate Republican Leader came out against the common-sense reforms we’ve proposed. In doing so, he made the cynical and deceptive assertion that reform would somehow enable future bailouts – when he knows that it would do just the opposite. Every day we don’t act, the same system that led to bailouts remains in place – with the exact same loopholes and the exact same liabilities. And if we don’t change what led to the crisis, we’ll doom ourselves to repeat it. That’s the truth. Opposing reform will leave taxpayers on the hook if a crisis like this ever happens again. Read the entirety of his remarks, or view the video. For more on this still developing situation , I filed my posts under the categories Mitch McConnell and Financial Reform. Maddow makes it clear. Republicans are liars, and are representing the interests of Wall Street rather than those of the American people. Earlier in the week, I talked about Mitch McConnell, and the GOP’s efforts to kill the financial reform bill now in the Senate. As of yesterday, the lies from the GOP were coming ever faster and more furious. And all based on a memo by GOP pollster Frank Luntz, concerning tactics to be used by the Republicans to kill health care reform, which talking points have now been converted and used to attempt the murder of financial reform. Imagine that. Republicans lying. Republicans protecting Wall St. and the very financial services companies that drove us to the brink of economic collapse. Barney Frank obliterated the nonsense last night on Hardball. Last week McConnell attended a private meeting with 25 Wall Street executives, many of them hedge fund managers. reform bill. His excuse making harkens back to the much publicized GOP strategy memo written by pollster Frank Luntz. In point of fact, his arguments against reform are close to exactly as Luntz urged the GOP to make. In order to prevent future taxpayer bailouts of the big banks, to prevent our economy from spinning out of control again, to protect our country from financial insolvency, we must legislate financial reform. Period. 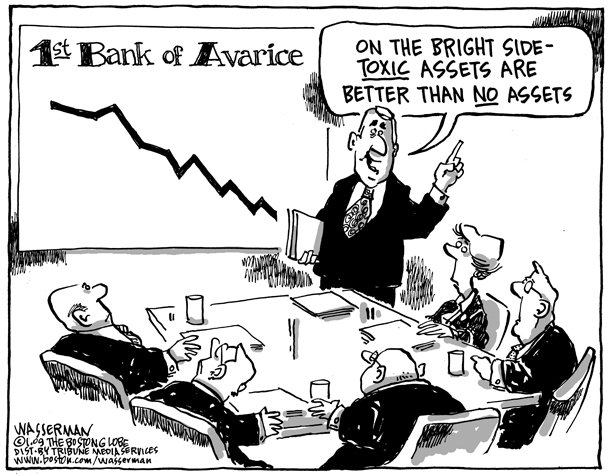 The removal of controls on the financial services industry is what got us in to this mess to begin with. If we listen to the Republicans we are asking for more of the same. The White House has just announced that President Obama has made fifteen recess appointments, including several for hot-button nominees. These are appointees Republicans refused to allow votes on and for which the president's supporters have been pressing for recess appointees. Notable on the list are Craig Becker to NLRB and Chai Feldblum to EEOC. President Obama's decision to bypass the vacationing Senate and directly appoint 15 nominees has produced some expected cries of outrage from Republicans. An excellent piece in which Maddow is able to factually demonstrate the complete and utter hypocrisy of the GOP. 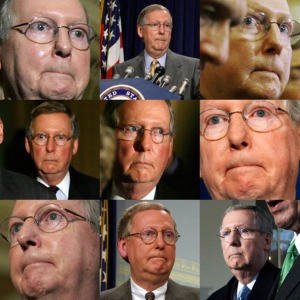 Mitch McConnell: "Republicans are more fun and interesting people." :: While the GOP has definitely become the party of clowns, I don't think too many people would describe them as "fun" and "interesting". In his CPAC speech, Senate Minority Leader Mitch McConnell insisted that conservatives are more "interesting" and "fun" than liberals. Here's his proof: "who wants to hang out with guys like Paul Krugman and Robert Reich when you can be with Rush Limbaugh?" And you can taste the difference, too! After all, Paul Krugman is an economist who worries that Obama might fail to restore the economy. Whereas Limbaugh is a radio talk show host who hopes Obama might fail to restore the economy. Which one sounds more "fun" to you? And honestly, is a nuke directed at Chicago really very funny?. This morning, former U.N. ambassador John Bolton spoke to the Conservative Political Action Conference (CPAC). He tried to up the fear quotient in the room by raising the prospect of an Iranian-sent nuclear attack on an American city. "It's [a] tiny [threat] compared to the Soviet Union," Bolton said, "but is the loss of one American city -- pick one at random: Chicago -- is that a tiny threat?" The audience erupted in cheers and laughter at the idea of Obama's home city being obliterated. That's truly hilarious, isn't it--the nearly three million Americans who live in the third largest city in the U.S. wiped out in a nuclear holocaust? Definitely worth laughing at and, yes, cheering for. We had a situation — you should direct that question to Senator McConnell because we had trouble organizing this year. He wanted to maintain a lot of their staffing even though they had lost huge numbers. And the only way we could get it done is to do what we did. 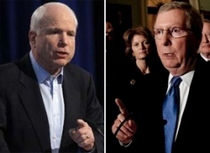 Johnny and Rush - John McCain, who has long loved to call himself bipartisan, and sure as hell shoved it down our throats falsely when campaigning, stands up for NO. 1 GOP partisan, Rush Limbaugh in his assholishness towards President Obama. The Dems and the business tax cuts - Give it up. The partisan Repugs are not holding out a vote, they are holding out forked, sharp sticks. Take the damn business tax cuts back out, and tell 'em to screw themselves. We have a freaking majority. Use that power. Repugs = IRRELEVANT. 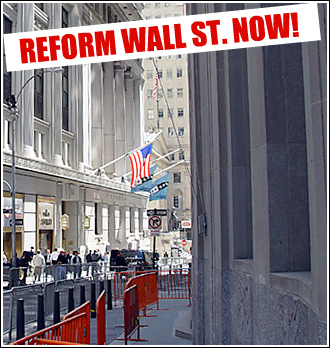 President Obama, and the 111th Congress - Wall Street needs to understand that they can not take taxpayer money and then proceed to do business as freaking usual. Make them take back those bonuses and put someone in place to monitor their every idiotic move. You owe it to us. The American taxpayers. Really. DO. IT. 2012 is approaching. That's it for this week, unless you have something to add via a comment.